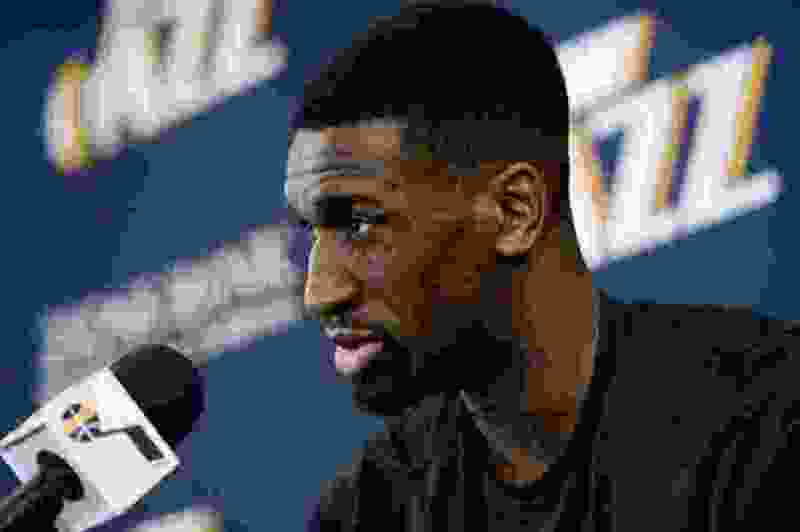 (Francisco Kjolseth | The Salt Lake Tribune) Utah Jazz center-forward Ekpe Udoh speaks with the media during exit interviews at their practice facility in Salt Lake City Wed., May 8, 2018, after losing to the Houston Rockets in game 5 of their Western Conference Finals during the 2018 NBA Playoffs. By the end of last season, “stay ready” had become a mantra of sorts for a faction of the Utah Jazz bench. With as much depth as the Jazz boasted, there simply wasn’t enough playing time to go around among some guys who were a part of the rotation in the beginning of the season. Udoh was one of those guys. So were Alec Burks, Raul Neto and Jonas Jerebko. Udoh didn’t know if or when he was going to play from game-to-game. But his professionalism, his support of his teammates, his work in the community, and not to mention his defense, won him a lot of fans in the Jazz organization. A few weeks ago, the Jazz guaranteed Udoh’s contract for a second season, making him a rarity: a former lottery pick who initially didn’t stick in the NBA, matriculated overseas, remade his game and came back to the league. Udoh’s season was a roller coaster of sorts on the floor. He was a primary reserve for much of the first half of last season, playing consistent minutes through December. He was a sporadic starter when Rudy Gobert and Derrick Favors encountered injury issues. By the second half of the season, those minutes primarily dried up. Jazz coach Quin Snyder made a change to the rotation, playing Favors as his backup center, significantly affecting Udoh’s minutes. And then, the Jazz traded for Jae Crowder and played him as a smaller power forward. Udoh never complained, not once. He still wore a perpetual smile around Utah’s locker room. His community service through his monthly book club never waned. So, for what basketball reasons did the Jazz bring Udoh back? The answers are simple, if yet complex. Udoh wasn’t a scoring threat, averaging 2.6 points per game. But, he came to the Jazz with the reputation as a terrific defender and he didn’t disappoint. He averaged 1.2 blocks per game. More importantly, he may be Utah’s best big man in terms of hedging defensively on the perimeter and staying in front of smaller players, which is a critical skill for a big in today’s NBA. As a third center, Udoh’s valuable, especially if he understands and is fine with sporadic playing time. Secondly, the Jazz play well with Udoh on the floor, in no small part due to his defense. Udoh posted a positive net rating last season, and for a long stretch had one of the best net ratings on the team. Maybe most importantly, especially for his role in the upcoming season, Udoh showed an ability to come up big in games after sitting for long stretches. The ability to stay ready, if you will. In a January road win over the Washington Wizards, with Gobert and Favors out with injury, Udoh stepped in and provided 16 points, nine rebounds, four steals and two blocked shots in 34 minutes. He hadn’t played that many minutes in a month. He wouldn’t for the remainder of the season. Off the floor, Udoh fit seamlessly with the Jazz culture. He’s become a respected veteran presence in Utah’s locker room. He and Thabo Sefolosha are strong voices concerning social dynamics around the country. He’s looking forward to improving his game as the offseason reaches its concluding stages. OTAs for the Jazz are roughly six weeks away. And Udoh has spent a large chunk of the summer in SLC working out with Utah assistants.